There is only one all-star game in professional sports that truly captures the essence of the game…Major League Baseball . Many people don’t like the fact that the result of the game determines home-field advantage for the World Series, but that is irrelevant in the scheme of things. The bottom line is that the game should be about watching the best players in the world showcase their talents for baseball fans everywhere. Unfortunately, Royals’ fans in Kansas City took it upon themselves to disgrace both the Home Run Derby and the All-Star Game with their relentless booing of New York Yankee – Robinson Cano. Even more disgraceful is the fact that these same fans verbally attacked Cano’s family in the stands for no reason whatsoever. Failing to choose Royals’ DH, Billy Butler, to participate in the Home Run Derby in front of the hometown fans. Did the fans have a right to be upset with Cano’s choices? Perhaps, but only because the game was being played in Kansas City, not because of merit. There are currently 15 American Leaguers with more home runs than Butler this season. Of the participants chosen, only Prince Fielder had less home runs than Butler heading into the competition, and he only trailed by one home run. And the fact of the matter is that baseball fans love to watch Fielder hit home runs, while only Kansas City fans were interested in seeing Butler. Based on Fielder’s dominant victory, and the performance of the other American Leaguers chosen over Butler, it seems like Cano did a good job picking his team. Does it make sense to have captains choosing their team instead of just being the leader of their respective teams? In my opinion, it does not. And after what happened to Cano and his family this year, it would be surprising if Major League Baseball doesn’t take over that responsibility going forward. Many people hate the New York Yankees because of their bloated payroll and continued success; it is their right to feel that way. But that is not an excuse to treat the individual players with such disdain, especially when there was no heinous act committed. The Yankees have no bigger rival than the Boston Red Sox, but even Red Sox slugger, David Ortiz, came out to try and help Cano as he struggled mightily during the Home Run Derby. 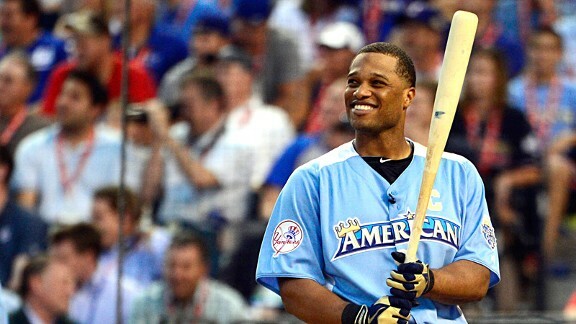 Despite the fact that Cano hit no home runs during the competition, the smile never left his face. He handled the classless crowd by taking the high road as he always does. Royals’ fans celebrated each of Cano’s outs with a fever pitch that sounded like they had just won game 7 of the World Series. Of course, the last time that happened was October 19, 1985. Since that time, the team has been relegated to irrelevant status, while the Yankees have won five world championships, to go along with numerous playoff appearances. At the end of the Home Run Derby and All-Star game, the Royals are still a non-factor in this year’s playoff race, but they are no longer irrelevant. Unfortunately for them, they are not relevant for their play on the field, but rather for their classless fans who acted like petulant children when their hometown hero was passed over by Cano for what was supposed to be a fun exhibition. Thankfully, the crowd at least had the decency to cheer for Chipper Jones in what was very likely the final All-Star Game at bat of his illustrious career. However, that moment is a case of too little, too late when it comes to how America will likely view Royals’ fans going forward.